This is an off-the-cuff reaction, a response still in process. Normally I take time to process my thoughts and allow them to marinate for hours, days, or weeks before putting them here. But this one is a little raw, and maybe it should be. There are any number of responses to the intense emotion that Sherman displayed. He was less than five minutes removed from the biggest play of the biggest game of his life. He is an incredible athlete playing at the top of his game. He would not be the player that he is without his intensity. But we have grown accustomed to calm and “professional” responses from our athletes. We expect more predictable responses on-air. Rarely do we see such raw and visceral responses, but we did tonight. If you have ever been a part of an athletic team, you understand the emotions, even if not on the same level as a professional athlete. But…was the response warranted? Here’s my concern. Here’s the unfortunate part. There will be people among the millions watching who will see that as all that Richard Sherman is. If you turned the tv off or have never heard him interview before, you’re missing pieces to the puzzle. Sherman was interviewed twice more on-air and will be interviewed many times leading up to the Super Bowl. He will smile. He will wear suits and bow ties. And he will continue to state that he is the best. But, for some, there was an image that went out that falls into an unfortunate script: Richard Sherman is an angry black man. This is a script we do not like to talk about. It is a script we may not mention – ever – but we may feel it, regardless of our own ethnic background. When I use the word “script,” I’m talking about the unspoken narrative in your life. I refer to the series of experiences and beliefs that have helped shaped who you are and how you see the world. And, unfortunately, there is a place in that narrative for an angry black man. The most unfortunate part about our internal script is that we only need one person to play it in order for us to justify it. 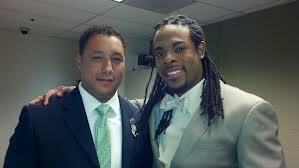 I do not see Richard Sherman as an angry black man, but I cringed at the intensity he displayed on-air. Not so much because of his emotion, but because he was directing all of his visceral response at another person who just happens to be another black man. I don’t know Richard Sherman. Chances are you don’t either. But you have to make a decision on what role his on-air emotion plays in your narrative. Growing up where I did allowed me to know that there are countless people who will never know a Richard Sherman – a black man. They may not even meet a black man depending on how they choose to live. So how do they fit people into their narrative? They will do so based on other people’s opinions, media portrayls, and their own experiences. And many, many people, whether they will ever say it, believe that they saw an angry black man tonight. I have three sons who will be black men. Whether you see it in their skin tone or not, you can see it in their hair. You will know. And somewhere, some day, my sons might get angry. We respond to other people’s anger in very raw ways ourselves. We respond to the anger of black men in very, very tragic ways. Tomorrow my sons will attempt to change the script. Their school will have an in-session celebration of the life of Dr. Martin Luther King, Jr. They will learn more about the changes Dr. King fought to make. They will learn more about the unspeakable violence that was inflicted on people of all colors who sought peace. And I hope that they will learn that this battle continues. I recently realized – way too late in life – that white people should stop waiting for everyone else to fight for racial equality. It’s the lie that comes with what we call “white privilege,” the idea that racial equality and justice is everyone else’s problem. It’s time to change the script. If you want to change your script, do what I said many will not do: get to know someone. Learn that they are not their skin color. Learn that they are not their profession. Learn that their anger, no matter their race, is no different than yours. Learn that equality and racial equality is everyone’s torch to carry. If you won’t do it for me, do it for you. If you won’t do it for you, do it for my sons. Years after peaceful demonstrations, violent responses, and legal battles, we’re still fighting unfortunate scripts. The next person interviewed after Richard Sherman was Paul Allen, the billionaire white man who owns the Seattle Seahawks. If you don’t think that something needs to change when we see a wealthy white man celebrating his ownership while an athlete, who happens to be black, calls out another black man as “sorry,” then please wake up. Normally I would give this more pause. I would be careful with my words because I’m concerned with what you think. My script of the quiet, thoughtful white man does not often allow me to take risks of being misinterpreted. Maybe it’s time to change my script.